Here are the rest of the 24 black cocktailers I made. If this dress looks a little familiar it is because it was inspired by this gorgeous DeaAnna Denton dress. When I cut of the bottom of the pleated skirt that I used to make the "Rear Window" dress, I knew I had to make Gene a copy of DeeAnna's dress. Of course it's not exact, but Gene loves her version of DeeAnna's dress. I cut the scalloped part off of some lace trim and sewed it to the bodice neckline. 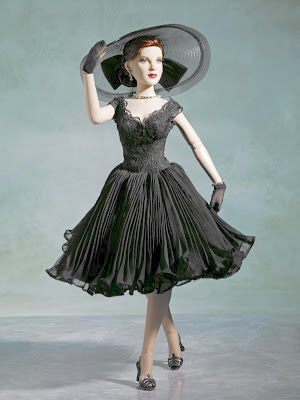 "Twilight Girl" is wearing a dress made with the same lace bodice and a full circle chiffon skirt. Here is the same bodice with a lace skirt. I think the shorter skirt gives it more of a late 50's early 60's look. I wish I had used red flowers instead of pink ones. I love it when you put detail such as the scalloped part of some lace was trimmed and sewed to the bodice neckline. It makes someone like me who does not sew well appreciates the effort in making this dress. The bodice with lace skirt is my favourite. If it is in white or ivory colour, it makes a nice vintage wedding gown. Just add a nice bandeau style hat(with the same material as the gown) with tulle on the front, think of Jennifer Lopez in The Wedding Planner. You did so well with the cut! Beautiful!